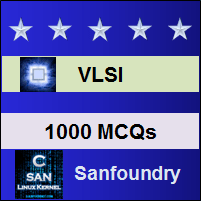 This set of VLSI Multiple Choice Questions & Answers (MCQs) focuses on “Multiplier Systems”. Explanation: A multiplier is an electronic circuit used to multiply two bianry numbers. It is built using binary adders that is full adders. 2. Which method uses reduced number of partial products? Explanation: Multiplication in multipliers is done by obtaining partial products and then summing it up. Modified booth encoding reduces the number of partial products that must be summed. 3. Which method is easier to manipulate accumulator content? Explanation: It is easier to right shift the contents of accumulator than to left shift. This can be used to eliminate the least significant bits of the product. 4. Which multiplier is very well suited for twos complement numebers? Explanation: Baugh-wooley method is used to design multipliers that are regular in structure and is very well suited for twos complement numbers. 5. What is the delay required to perform a single operation in pipelined structure? Explanation: The delay of one operation through the pipeline is 3n that is it takes 3n clock cycles to obtain a product after X and Y are input. Explanation: The latches choosen are dynamic shift register as the structure will be continuously clocked. 7. Which method reduces number of cycles of operation? Explanation: Modified booth encoding algorithm avoids many idle cells in a cellular multiplier as well as reduces the number of cycles compared with the serial-parallel multiplier. Explanation: The completion time for multiplication in Braun or Baugh-wooley is proportional to 2n where as completion time in Wallace tree method is proportional to log(base 2)(n). 9. In which method minimum number of adder cells are used? Explanation: Dadda multipliers are similar to Wallace trees but it has reduced number of adder cells. This is a technique developed from Wallace tree but with an improvement. 10. Which method is suitable for larger operands? Explanation: Wallace tree multipliers should be used for larger operands and where the performance is critical.